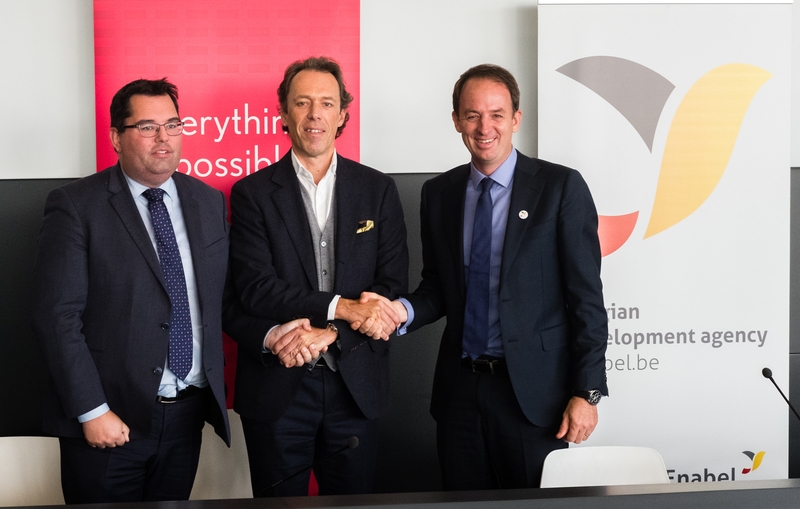 Antwerp, 14 November 2018 – The Port of Antwerp and its consultancy Port of Antwerp International (PAI) subsidiary signed a Cooperation Agreement with the Belgian development agency Enabel to join forces in developing ports in a sustainable way in developing countries. Ports are key for developing a country. For the Belgian International Cooperation it is important to offer the right expertise to partner countries in Africa. Improved port efficiency thanks to consultancy, training and better infrastructure strengthens a country’s logistical supply chain, which positively impacts a country’s competitiveness and job creation. The Cooperation Agreement was signed at the Port House, the stunning new headquarters of the Antwerp Port Authority, by Jacques Vandermeiren, CEO of the Antwerp Port Authority, Kristof Waterschoot, Managing Director of PAI, and Jean Van Wetter, Managing director of Enabel, the Belgian development agency. The Cooperation Agreement aims to combine forces and start working more closely together to sustainably develop ports in developing countries.